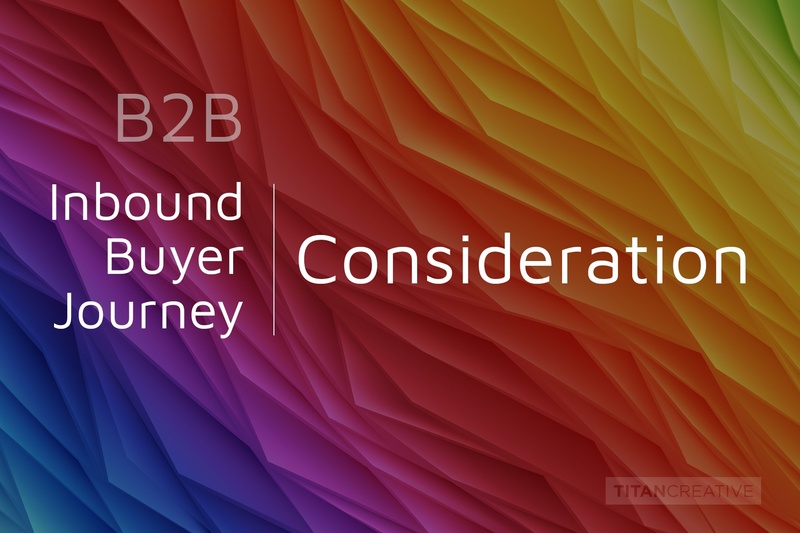 The consideration stage is a crucial period for B2B organizations. It’s also known as the middle of the funnel, or the evaluation phase. A problem or challenge has been clearly defined, and researching potential solutions is now the primary focus. How much time do prospects need to learn and consider options? Unlike a consumer product where one individual is usually the primary decision maker, in a B2B context the final decision is likely to need multiple approvals from various different levels of management, as well as a compliance process and perhaps a legal process. Solutions and products can also be complex, and have implications to other areas of business. That means the consideration period can last longer, which makes sense – the decision to buy a new outfit for $100 doesn’t warrant as much scrutiny as the decision to buy a new software solution for $10,000. During this period, a strong Inbound marketing strategy will continue to nurture these prospects. What kind of content is used for the Consideration stage? Once you’ve identified that a lead is in the Consideration stage, you want to bring them further through the funnel, beyond the introductory Awareness information and into helpful information that offers true value in understanding options. At this point, it's not about selling your product or solution. It's about offering guidance. Educational content is the focus. The more you show your prospective clients how your organization helps them solve problems, the more likely they are to want to work with you. Potential formats for Consideration stage content might include a live webinar, a white paper, an eBook, or a series of training videos. Some high level thought leadership pieces can be very effective tools. For example, a financial services firm might put together a ‘How to make sure you are ready for an audit’ eBook, a telecom carrier might put together a white paper with industry trends, a software company might provide useful videos that take a deeper dive into the challenges facing prospects, and potential solutions. Helpful tip: Leverage sales intelligence. Consult your sales team and find out what key questions and challenges they are hearing about about from prospects. Build out content that preemptively answers these questions, using content titles that borrow from your prospects' real-world phrasing. Should I talk about our company or brand at this stage? You can, but only in a limited fashion. Remember that at the Consideration stage, your lead has already identified a problem and they are looking for solutions like the ones your company provides. Your main goal at this stage is to provide value to your prospects as they learn and evaluate options. You can mention your brand, but the focus at this stage needs to be on helping, not selling. How do I know when prospects are ready to move on? Running A/B tests is especially important during the Consideration stage, because the length of time prospects spend at this stage can vary considerably by sector, budget and product. By running tests you can learn what is resonating with your prospects and start to get a sense of how close they are to the next stage. You could consider having a smart 'trackable' Call To Action that offers a 'next step' that would be relevant to making a decision. If a prospect responds to this CTA you know they are now actively considering pulling the trigger, and it's time to show them why your service, product or solution is the right choice. Up next: The Buyer Journey | Decision Stage.